I first smelled Cardamom French Toast in store and I was intrigued by it. I like French toast, but I’ve never had French toast with cardamom before (although a quick Google search buries me with recipes). The tea itself has a very strong aroma. It smells heavily of cinnamon, coriander, and cardamom. I can’t actually make out the tea base at all, just all the added ingredients. The smell of the dry tea doesn’t make me think of breakfast, but hopefully the tea will! Cardamom French Toast is made up of: black tea, cinnamon, lemon peel, coriander, cardamom, coconut sugar, cane sugar, natural & artificial flavouring. DavidsTea’s recommendation for Cardamom French Toast is to steep in 96°C (204°F) water for 4-7 minutes. I steeped my first cup for nearly the full 7 minutes, mostly because I forgot about it (whoops!). I need to start off by saying that Cardamom French Toast smells amazing when it’s steeping. It has a heavily spiced aroma that reminds me a lot of cinnamon buns in a bakery. Just that rich, spicy, buttery aroma. It smells like a bakery in a cup, which is really impressive. It steeps to a lovely deep amber colour. This tea is sweet. As someone who loves sweets and thinks that cake is an appropriate meal at times, I am being truthful when I tell you that Cardamom French Toast is sweet and doesn’t need the addition of a sweetener because it has plenty of sugar. It has a very heavy cinnamon and cardamom taste to it, but it doesn’t remind me of French toast in any way. It reminds me a lot more of cinnamon buns than French toast, if I were to pick a food item that it reminds me of. The tea is very warming, it likely has to do with all the warm spice ingredients, but it makes me feel warm and cozy. I attempted a second steep of Cardamom French Toast and had a cup of tea that reminded me nothing of steep #1. I would say that Cardamom French Toast is good for one steeping. I liked DavidsTea’s Cardamom French Toast. While the tea didn’t remind me of French toast, it did remind me of cinnamon buns. 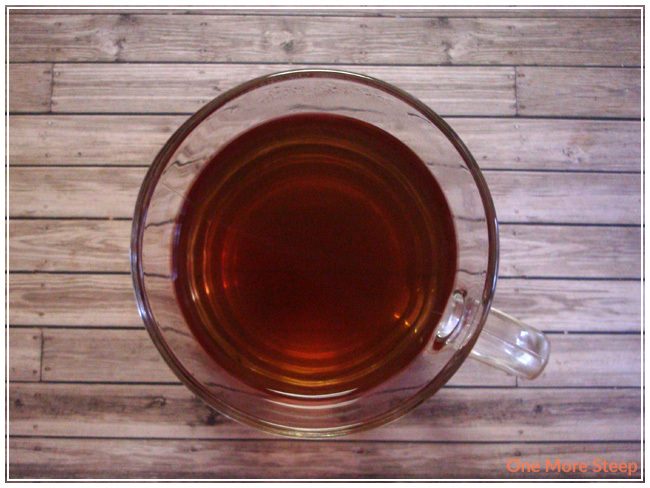 It’s a very comforting and warming tea, which I really enjoy. 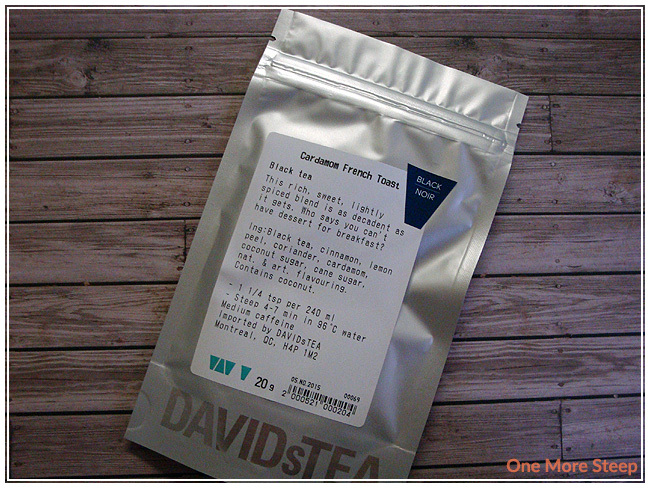 I think it has a great flavour profile, although it isn’t appropriately named, and it is a great winter time tea. It would make for a good choice for sipping while being cozy under a blanket, or to have as a treat after shovelling snow. In store it reminded me of street chai in India or really strong chai I have had in Seattle. 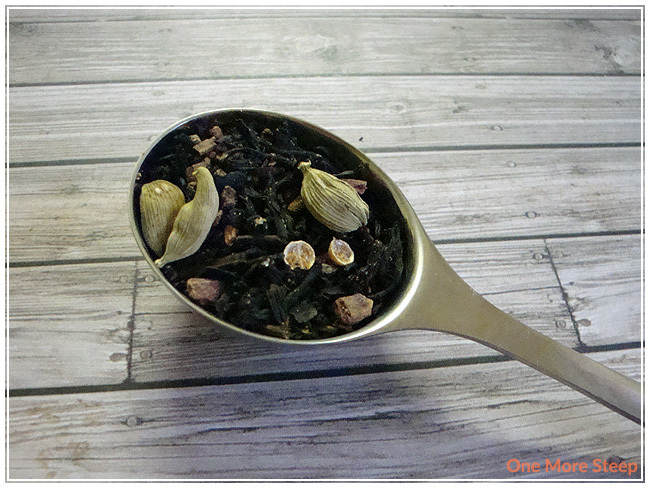 When it is steeped if you don’t get the actual pods it tastes very different than a cup with a few pods.